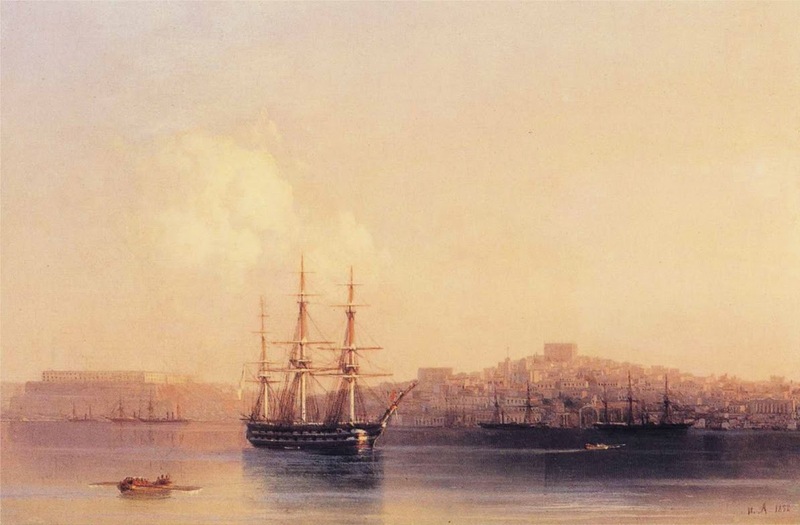 Painting by Ivan Constantinovich Aivazovsky (1817-1900). One of the foremost marine and seascapes painters in history, Aivozovsky worked in many countries, and liked to incorporate mountainous views into the scenes. As capable as any of capturing the drama of a turbulent sea, he more often showed a tranquil sea that brings on a mood of reflection. Dramatic lighting, dominated by sun or moon, with almost Turner-like intensity, was a specialty of his coastal paintings, but not always present, as in the example below.